Sir Ivan Rogers unexpectedly announced his resignation yesterday. File photo of former British representative to EU Ivan Rogers (right). BRITAIN’S AMBASSADOR TO the European Union criticised London’s serious lack of negotiating experience ahead of Brexit talks, hours after announcing his resignation yesterday. 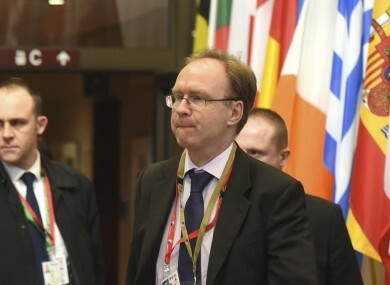 Ivan Rogers stepped down from his role less than three months before Britain is due to begin talks to leave the bloc, cutting short his term which was due to end in October. A highly-regarded diplomat, Rogers was criticised last month for saying it would take 10 years for Britain to conclude a trade deal with the EU. In a lengthy resignation email to staff at UKRep, the office which represents Britain in negotiations in the EU, he urged colleagues to speak up even when their views were not welcome. “I hope you will continue to challenge ill-founded arguments and muddled thinking and that you will never be afraid to speak the truth to those in power. “I hope that you will support each other in those difficult moments where you have to deliver messages that are disagreeable to those who need to hear them,” Rogers said in the note, published by The Times newspaper. Rogers, who has held the post since November 2013 and previously served as prime minister David Cameron’s Europe adviser, also criticised the British government’s lack of preparation for the divorce proceedings. “Serious multilateral negotiating experience is in short supply in Whitehall, and that is not the case in the Commission or in the Council,” said Rogers, pinpointing a gap in preparedness for Brexit talks between the British government and EU institutions. Britain voted 52% in favour of leaving the bloc in the country’s 23 June referendum and anti-EU campaigners have since claimed Rogers has a pessimistic view of Brexit. But supporters of the outgoing EU envoy have meanwhile praised him for being a realist, with credibility gained from his lengthy experience. Email “British ambassador to EU criticises 'muddled thinking' in Brexit negotiations following resignation”. Feedback on “British ambassador to EU criticises 'muddled thinking' in Brexit negotiations following resignation”.